Mushroom Wars 2 is a magnificent title, and I’m hooked (and so is my wife, and so should you be). The childlike theme – little, tiny mushroom people (or aliens, or ghouls), fighting little, tiny mushroom wars – belies the depth of strategy at hand. The wide variety of interestingly balanced maps and battle modes, the twelve separate heroes, each with four different specials, the morale system, different types of buildings, and upgrades for each (except the forge), and, not to mention, the movement options provide for a level of gameplay permutations that would make Chipotle blush. I’ll say it again: Mushroom Wars 2 is a magnificent title. At OPnoobs, we don’t really give out 10s, as those are more a product of time, but if we did Mushroom Wars 2 — for the mobile — is a 10. We will, for years, see clones and copies of this game, and I struggle to think in what aspect any derivatives could improve upon what’s already there. 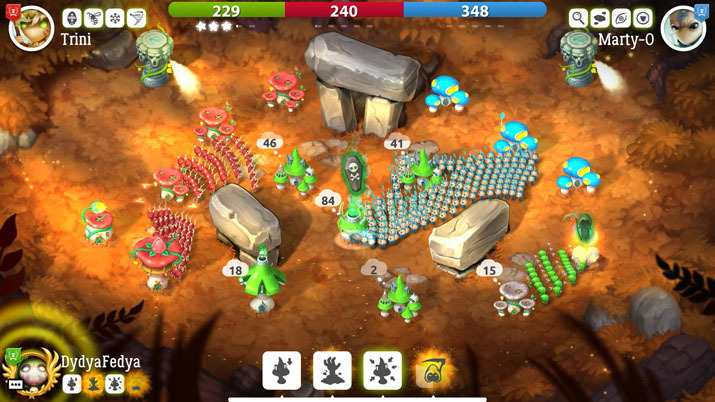 Although there is a campaign mode, Mushroom Wars 2 dominates in the PvP experience. It’s hard to overemphasize the potentialities of gameplay; with but the simple ingredients listed above, a million battles unfold. Maybe your opponent will rush you, maybe they’ll hunker down and get upgrades — and if they do, how do you plan on cracking their defenses? Or maybe you’re disadvantaged (there’s a bar at the top that shows what percentage of the total units are controlled by you, and what percentage are controlled by your opponent — a rough measure); if so, how do you plan on turning it around? Attempting to hold the line? A sneak attack? What does the morale situation look like? How has your opponent been moving recently — where are his troops and what is his play style? You have to consider this line of questioning, and all the possibilities, in real time, and often in seconds, if you need to hit a critical window. You never have to wait more than a yawn for a new game to start up, and if you don’t like the stress of ranked competition, Zillion Whales put in an Arcade Mode so that you may bash it out unranked. Personally, though, I’m not a fan of the Arcade Mode since it’s over a 3-player free-for-all, and I’m usually leading but as soon as I turn for one, the other flanks me; that’s why I go 1-v-1: no excuses. Come at me, bro. But, sadly, some of this magic is lost in the PC version. The quaint tininess of the mushrooms and the battles is all but obliterated on a 31” LED monitor. The in-the-battle feeling, a general with his troops, is ripped away and replaced with clicking — “clicking,” doesn’t that sound disgustingly foreign to you? It’s still pretty; the music is still catchy; but the mechanics of dragging your finger over to the building you want to hit, or dragging the special effect onto your troops, are diminished (note that this latter mechanic frequently collides with the ‘slide up’ feature on the iPhone, which, mid-battle, is infuriating :D ). Mushroom Wars 2 is a wonderful game to play and an amazing competition to watch. There’s so much to talk about, anticipate, and be surprised by, that I expect this title to live on for many, many years. 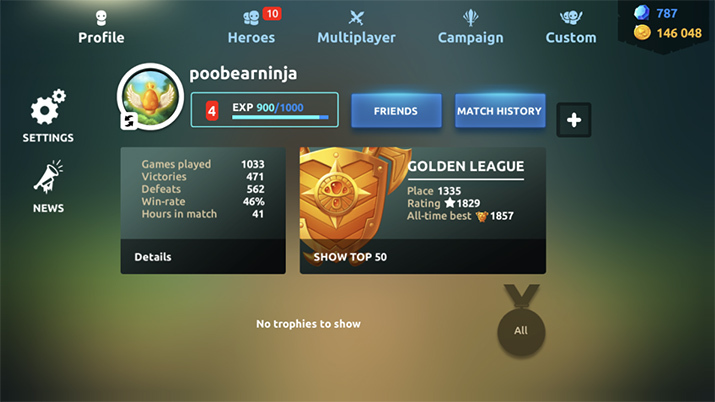 The developers have been truly successful of creating the tools for a competitive player to use — and then getting the hell out of the way; Zillion Whales leaves us with a trendsetting, unrivaled masterpiece, and then lets us play it the way we want to play it.